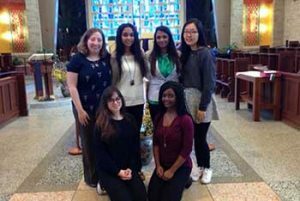 This past weekend seven students from St. Agnes Academic HS came to St. John the Baptist HS to begin a weekend of prayer, study, and the forming of community. These students were the latest group who attended one of our youth preaching workshops. They learned how to bring to life their baptismal call to “preach the Good News” by using the gifts and talents that have been given to them by our loving God. 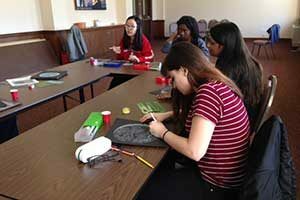 One of the highlights is when the students visit the Motherhouse on Saturday and join the retired sisters for an ice cream social. This is a fun event for all who participate. This years ice cream social was special indeed as it was part of the National celebration of Catholic Sisters Week. These young people are hungering for any opportunity to come closer to God. One need only listen to their reflections during our prayer times to hear the hunger in their hearts for relationship to the Divine! How blessed are we to be able to provide a venue to foster and ignite that relationship. The participants continue to find the weekends very spiritual, prayerful and a great deal of fun. Most importantly, many stay connected to us after experiencing the weekend. 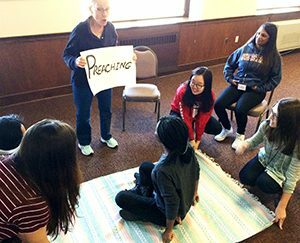 Some return as youth mentors and have the opportunity to lead a new group of young preachers, some have volunteered on the 3rd and 4th floors, and still others are a part of the Dominican Youth Preaching Club at St. Agnes HS. Many of these same young people will attend this years National High School Preaching Conference in Michigan. However they choose to stay connected, we are grateful for their presence amongst us. I am forever grateful for the continued presence and assistance with these weekends from our sister Barbara Schwarz and or former youth preacher, now Dominican Young Adult, Jessica Abejar. I am also grateful for the willingness of our sisters who reside here in the Motherhouse to come and join us for some quality time. I am sure that all would agree that these programs have been a blessing to the participants and to the Congregation-at-large in whose name the programs continue. If any group is interested in participating in these weekends, please contact me. All high school age students are welcome.